COMMENTARY ON "JESUS BADE THEM, 'FOLLOW ME'"
"...Jesus’ followers were demonstrating His love through meeting the basic needs of those around them. That’s what Jesus did when He was here, and that’s what His followers are to do as well. No wonder, then, that when given the offer to follow Jesus, so many did." Since the memory text is about why the sheep safe within the sheepfold will not follow after the voice of an imposter it is disingenuous to use this text to speculate on why Christianity grew so rapidly in the Roman Empire. After all, the unsaved within the empire who were becoming Christians would not yet be safe within the sheepfold and therefore wouldn't know the voice of the Good Shepherd Jesus Christ. Something not addressed in the lesson was happening within the Roman Empire. While important to show your faith via your 'good works' (James 2:14-17) what attracts the world to becoming a Christian is the love a Christian has for all other Saints of God, those who are safe within God's sheepfold. Of course, this kind of love extends to include all lost sinners of the world. To be in the kingdom of God (his sheepfold) your faith that results in this kind of love must be founded on nothing more nor less than the gospel of Jesus Christ for the remission of your sins, 1 Cor. 15:1-5. "Read John 10:1–5, 16. 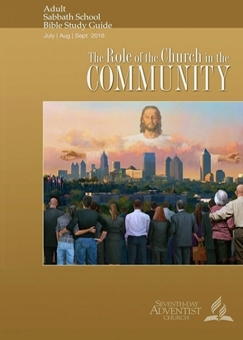 How do these texts illustrate the importance of why we, as Jesus’ representatives, must form positive and loving relationships with people in our communities as we seek to lead them to Jesus? How can we help them learn to hear His voice? The "thief" attempts to enter the sheepfold by not coming in through "the door". Jesus is the "door", the one who "lays down his life" for his "sheep". In-other-words, the voice of the "thief" will not be preaching of the death, burial and resurrection (1 Cor. 15:1-5) of the "Good Shepherd" for the protection of the sheep safe in the sheepfold. The sheep came into the sheepfold through the door which is "the good shepherd lays down his life for the sheep". The thief "climbs in by another way", meaning he lies by teaching something other than the gospel message which is nothing more nor less than the death, burial and resurrection of Jesus Christ for the remission of the sins of the world. This teaching from the very 'voice' of Jesus is so foundational and vital that the Apostle Paul invokes a curse upon anyone who would teach "a different gospel" that is no gospel at all, Gal. 1:6-10. Christians, those safe within the sheepfold, know the voice of Jesus. Therefore they will reject the voice of the thief, the one who teaches another gospel. Furthermore if you have not entered in through the door, 'the death, burial and resurrection' of Jesus Christ', you are not in the sheepfold of the Good Shepherd. The lesson stresses the idea that 'we are to seek fruit', meaning that Adventist's should be seeking all others in the world with the Adventist version of "the gospel" instead of focusing just on "the low-hanging fruit", identified by Adventists as "Christians of other denominations". As has been shown earlier this week, anyone who does not come into the sheepfold by the door, which is the gospel of Jesus' shed blood for the remission of the sins of the world, is a "thief" who is not speaking with the voice of the Good Shepherd. Since Adventism has traditionally focused on "the low-hanging fruit" of "Christians of other denominations" it is they who are guilty of attempt to steal fruit from the kingdom of God instead of reaching out to the “hard-to-reach fruit”. In the context of this lesson, the unsaved sinners of this world are the ripe field ready to be harvested. They become fruit in the kingdom of God only when they respond to the biblical gospel of Jesus Christ. The message of Adventism is no message at all, especially true for someone already secure in the sheepfold of the Good Shepherd. The Adventist use of the expression; "the low-hanging fruit" refers to born again Christians who have already been harvested and secure within God's sheepfold. "The Lord does not now work to bring many souls into the truth, because of the church members who have never been converted and those who were once converted but who have backslidden. What influence would these unconsecrated members have on new converts? Would they not make of no effect the God-given message which His people are to bear?”—Ellen G. White, Testimonies for the Church, vol. 6, p. 371." The challenge for all members to reach out to visitors certainly is a worthwhile agenda but connecting this with Zacchaeus' experience in meeting Jesus is a bit strained because the crowd that surrounded Jesus isn't really comparable to regular members of a worship service. Besides, the text doesn't really tell us why he wanted to see Jesus. What it does say is the extreme effort he went to in climbing the tree in the hope that it would happen. Furthermore, it seems likely that he didn't anticipate that Jesus would actually stop, speak to him and invite himself to Zacchaeus' home for lunch. The role of the Holy Spirit, John 16:1-15, includes the drawing of sinners to Jesus Christ. The crowds that surrounded Jesus simple illustrates what Zacchaeus, who was being drawn by God, was willing to do in order to see and possibly speak to Jesus. What Zacchaeus had was a face-to-face encounter with Jesus. What we have is the convection of the Holy Spirit and the Holy Scriptures coupled with the testimony of those who have already met Jesus. All those who are in the kingdom of God, including Jacchaeus, are drawn by the Holy Spirit to Jesus Christ. In the Ellen G. White quote she speaks of the "never been converted" and the "once converted" who fail to present Adventist "truth". Becoming a Christian doesn't occur when you learn and accept certain 'truths' even though knowing certain biblical truths are important such as knowing and understanding the gospel outlined in 1 Cor. 15:1-5. Rather you become a Christian when Jesus' shed blood covers and atones you, meaning Jesus has paid-in-full the penalty of death for your sins at Calvary. Unless you first have your own personal relationship, Acts 16:25-34, with Jesus as your Savior and Lord there is little likelihood you can become the vehicle through which the Holy Spirit convicts an unsaved sinner of the need to surrender to the Savior Jesus Christ. "But you may say, “I will take care of the first part of Jesus’ method, but I don’t do the bidding ‘follow Me’ part. That’s not my gift.” If you do the first part, you may surprise yourself by automatically sharing Jesus—and it will be so natural, so much easier, because you did the “groundwork” in the soil of their hearts." When a person hears, from your mouth, the gospel message of the death, burial and resurrection of Jesus Christ for the atonement and remission of the sins of the world it is the role of the Holy Spirit to convict a lost sinner of the truth of this message and a draw that person eternally into the kingdom of God. If instead, you feel compelled to preach "Sabbath Keeping" or Adventist "Health Rules" as having importance for a person's salvation you are not teaching the biblical gospel message. Jesus' gift of the indwelling Holy Spirit, not Sabbath Keeping, is the sign and seal of a New Covenant Believer in Jesus Christ, Eph. 1:11-14 & 2 Cor. 1:2--22. "Read Revelation 3:20, Matthew 7:7, 8, and John 1:12. In what ways are these three passages related, and what are they saying to us about what it means to seek and to find the Lord?" "In class, talk about your own conversion stories. How have you used them, or how could you use them to be a witness to others?" As a born-again Christian you grow in spiritual maturity through the ongoing work of Jesus Christ. There will be many 'chapters' to your testimony that glorifies yours Savior but only one 'conversion' story. Remember you are in the kingdom of God only through the ongoing power and work of your Lord Jesus Christ. Therefore there is nothing, not even your own self will, that can remove or separate you from the love of God, Romans chapter eight. Copyright 2016 BibleStudiesForAdventists.com. All rights reserved. Revised August 31, 2016. This website is published by Life Assurance Ministries, Camp Verde, Arizona, USA, the publisher of Proclamation! Magazine. Contact email: BibleStudiesForAdventists@gmail.com.